Where can I find Canadian postal code geometries? Where can I find the shapefiles for Canadian postal codes? Note that the Postal Code FSA Conversion files will be freely available as of Oct 24, 2012 as per the new data freedom initiative. See here for details. Geocoder collected the postal codes by crowd-sourcing. Canadian postal codes are not available for free download. You can either purchase the PostCode Conversion File from Statistics Canada or one of many value-added data sets from providers like DMTI Spatial. The lack of freely available PostCode data for Canada is a huge hindrance to business. UPDATE: 2016 FSA Census Boundary files are now available (as of Sept 13, 2017 according to their site). UPDATE: Stats Canada has since released the Forward Sortation Areas Boundary files (as of February 5, 2013 according to their site). While they make no mention of one specific to every possible Postal Code (nor do I think you're very likely to find one), they do list one for the FSAs but it does not as of yet have a release date. If you only need the geographic center of the postalcodes however (instead of the boundary), check out the free database at http://geocoder.ca/. You can obtain the approx center of the FSA from this as well by grouping them by the first three digits of the PostalCode and then averaging the Latitude/Longitude. SQL would help do this much easier if you import the data into a database first. Here's a query do do what I mean. I've also worked with another company out of Ontario called AGSI. Their database has FSA and LDU boundaries along with address points. Here is a link to a crowdsourced shapefile. I don't see how Canada Post can claim copyright over addresses submitted to a crowdsourced project, but I am not a lawyer and this is not legal advice. Not the answer you're looking for? 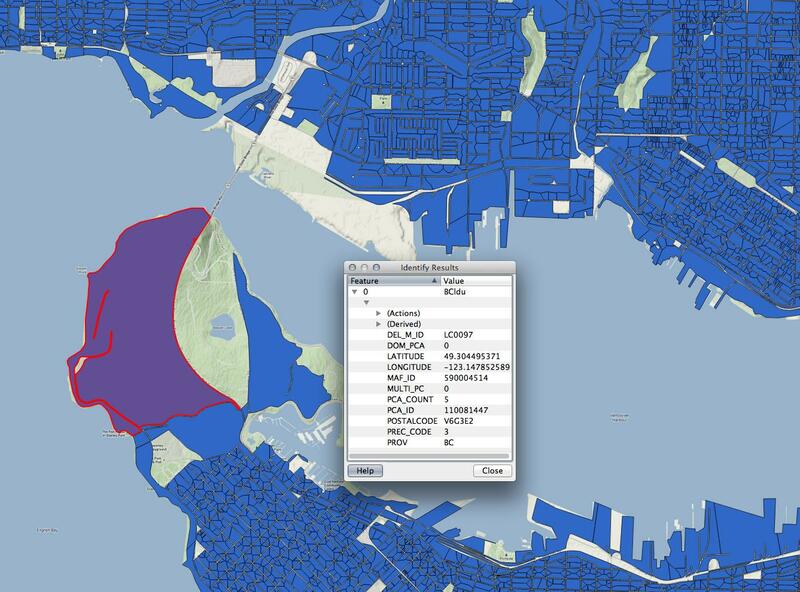 Browse other questions tagged shapefile data canada postal-code or ask your own question. Where can I find/buy Civic Address Data for all of Canada? Creating/generating LDU polygon boundaries of Canada? Where does Google get updated data about postal codes? Where can I find a global geocoding dataset based on postal code? Postal code shapefile for france? Converting Canadian census geocode to postal code? Applying Canadian Postal Code areas in shapefile to Google Earth?